Background: The objective of this survey was to explore the prevalence and burden of asthma in a Beijing population over 14 years old. Methods: In accordance with stratified cluster random sampling, epidemiological questionnaires were performed in Beijing residents aged over 14 years during household visits from February 2009 to August 2010. Asthma was diagnosed by case history, clinical signs and lung function test. Then the criteria-fulfilling asthmatics were inquired in more details. The statistical software SAS 9.2 was performed for data analysis. Results: In a sampling population of 61,107, 57,647 questionnaires were valid. Among 687 asthmatics, there were 296 males and 391 females. The overall prevalence rate of asthma was 1.19%. The rates of asthma prevalence were 1.09% and 1.40% in urban and suburb areas respectively. And the prevalence rate of asthma in suburb area was significantly higher than that of urban area. The prevalence rates of males and females were 1.06% and 1.32% respectively and the prevalence rate of asthma for females was much higher than that for males. Significant differences existed among different age groups. The residents aged at or over 65 years had the highest prevalence rate. The prevalence rates in urban and suburb areas increased by 1.12 and 2.26 folds respectively than that of 2002. And 198 first-diagnosed asthmatics accounted for 28.8% of all asthmatics. Conclusion: A significantly rising trend of asthma prevalence is plainly evident. The current prevalence of asthma is moderate in Beijing, but its impact remains challenging. Asthma is one of the most common chronic pulmonary disorders in the world. Under the combining effects of industrialization, urbanization, climate change and environmental or ecology pollution, the prevalence rate and mortality of asthma have increased sharply in many countries. [1-3] Asthma is also troublesome in China. It not only reduces the quality life of individual patients but also brings serious socio-economic burdens to the society and the family. Therefore asthma has become a global focus of prevention and control. However, the prevalence and burden of asthma may vary considerably between different regions of the world. Information on the epidemiological status of asthma among Chinese adults is both fragmentary and out-dated. As a result, effective intervention measures and prevention policies were not implemented. A comprehensive cross-sectional study of China Asthma and Risk Factors Epidemiologic investigation (CARE) was conducted to explore the prevalence, associated risk factors and impact of asthma nationwide covering  provinces/cities and  regions by China Asthma Alliance. This survey was part of CARE study conducted in Beijing from February 2009 to August 2010. The objective of this study was to describe the prevalence of asthma by gender, age, urban/rural setting and other socio-demographic characteristics and assess the influences of asthma on social life and families for the patients. The method of multi-stage random cluster sampling was applied to generate study population. In this report, the baseline data of the project was used. There were 16 districts and 2 counties in Beijing. They were classified into 3 categories of urban (Dongcheng, Xicheng, Xuanwu and Chongwen), suburb (Haidian, Chaoyang, Shijingshan and Fengtai) and outskirt (Tongzhou, Mentougou, Daxing, Fangshan, Changping, Shunyi, Huairou, Pinggu, Miyun and Yanqing). Firstly 2 districts or counties were randomly selected in each category. Secondly, in each of 2 selected districts or counties, 1-2 towns or street offices were randomly sampled as the target towns or street offices. Thirdly, in each of 1-2 selected towns or street offices, 1-2 communities or villages were randomly sampled as target communities or villages in each grade of 1-4. Fourthly, all residents in selected communities or villages were sampled district or county, 20,000 were sampled. And the total sample size was around 60,000 (Figure 1). Figure 1: Multi-stage random cluster sampling. The inclusion criteria were as follows: (1) Aged over 14 years, male or female; (2) Beijing residents living locally for no less than 2 years or non-residents living locally for over 3 years. Each subject was recruited from a randomly selected household to undergo an individualized and face-to-face home interview with a standardized questionnaire. 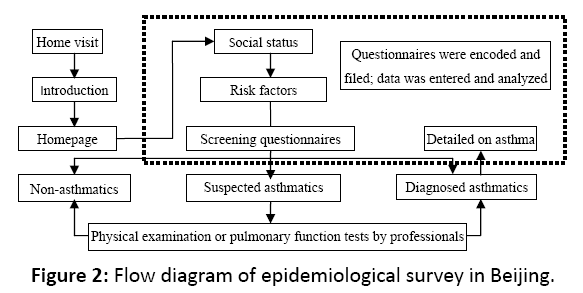 The epidemiological questionnaire included of socio-demographic characteristics (gender, age, race/ethnicity, occupation, educational level, health insurance and smoking history), clinical symptoms of asthmatics and the impact of asthma and so on. And an informed consent form was signed after the objectives and methods of the study were fully explained. Interviews were conducted by trained medical students or physicians and questionnaires completed under the supervision of medical students. The following six institutions participated in data collection: China-Japan Friendship Hospital, Peking University Peoples’ hospital, Beijing Chaoyang Hospital, Beijing Tiantan Hospital affiliated to Capital Medical University, Beijing Huairou First Hospital and Luhe Teaching Hospital, Capital Medical University. The interviewers received a training session in study overview and methodology and were instructed to avoid explanations potentially interfering with the participants’ answers. After multi-stage random cluster sampling, a cross-sectional survey of the prevalence of asthma in Beijing was conducted from February 2009 to August 2010 in six districts of Xicheng, Chongwen, Haidian, Chaoyang, Tongzhou and Huairou. A total of 61,107 questionnaires were distributed and 1954 residents declined participation. And the response rate was 96.9%. Since questionnaires were invalidated due to incomplete data, the final total sample size was 57,647. Males competed 27,947 questionnaires (48.5%) and females 29,700 (51.5%). The mean age of this population was (48.0±18.0) years with a range of 15 to 104 years and 14,008 (24.3%) participants were smokers. Their socio-demographic characteristics of gender, age, race/ ethnicity, occupation, educational level, health insurance and smoking history were summarized in Table 1. Table 1: Socio-demographic characteristics in samples of Beijing during 2010-2011. Figure 2: Flow diagram of epidemiological survey in Beijing. A total of 687 asthmatics were screened through questionnaire, physical examination, case history review and pulmonary test. The prevalence of average accumulated asthma of all population in Beijing aged over 14 years old was 1.97%. And 28.8% of them were never diagnosed with asthmatic diseases. Overall the asthma prevalence in Beijing urban and rural areas were 1.09% (418/38 468) and 1.40% (269/19 179) respectively. And the prevalence of asthma in rural area was significantly higher than that of urban area (χ2=10.850, P=0.001). In 2002, Beijing conducted the same kind of asthma prevalence survey.6 It made a longitudinal comparison of two surveys available. Compared with the prevalence in 2002, the prevalence of asthma in urban or rural areas in Beijing sharply increased by 1.12 and 2.26 times respectively than the previous decade (χ2=27.845, P<0.001; χ2=30.044, P<0.001). Females had a higher prevalence of asthma (1.32%, 391/29,700) compared to males (1.06%, 296/27,947) and the female-to-male ratio for prevalence ratio for prevalence was 1.25:1. This difference was statistically significant (χ2=8.098, P=0.004). According to different age groups, statistically significant difference existed in accumulated asthma prevalence among them. And the highest value was ≥71 years old population (3.09%) while the lowest stood at 21-30 years old (0.36%). There was an approximately liner trend of prevalence with advancing age (χ2=404.874, P<0.005). The asthma prevalence by age in males and females or different living settings was revealed (Figure 3). There was a difference in Han and non-Han race/ethnicity. However it was statistically insignificant (χ2=3.306, P=0.069). 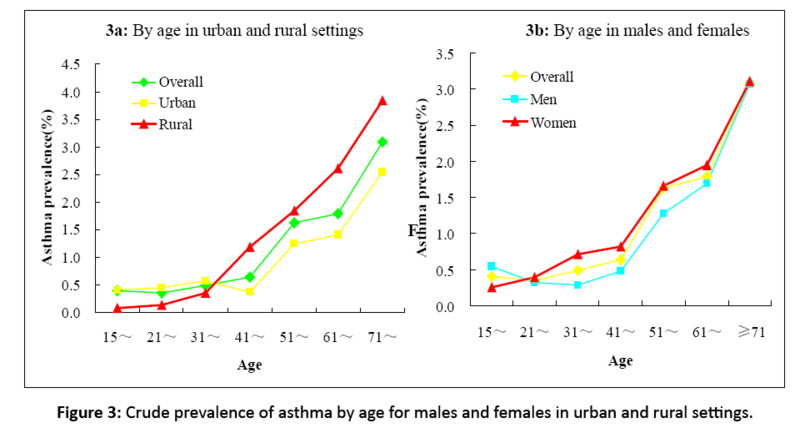 Figure 3: Crude prevalence of asthma by age for males and females in urban and rural settings. During asthma attacks, the most severe symptoms were wheezing (383/687), shortness of breath (167/687) and dyspnea (154/687). And the most predominant self-reported symptoms were wheezing (557/687) followed by dyspnea (497/687) and cough (484/687). Asthmatics with a history of smoking accounted for 31.9%. And 255 patients (37.1%) reported definite triggers of stimulating or aggravating asthma (Figure 4). 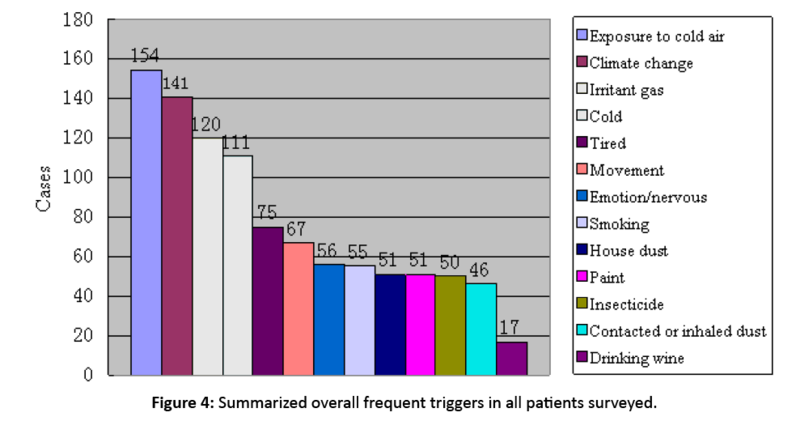 Figure 4: Summarized overall frequent triggers in all patients surveyed. 16.0% of responding asthmatics reported at least one visit to emergency service and around 1/4 (24.2%) had asthmarelated hospitalization in the previous year (Figure 5). Nearly half (46.6%) of them were handicapped by asthma. They became severely affected so as to interfere with entertainment, education, fertility and employment. And 65 patients (9.5%) reported that asthma led to severe psychosocial strains with their relatives and friends. Even 3.6% (25/687) of asthmatics harbored suicidal thoughts. Figure 5: Frequency of emergency visits and hospitalization in the previous year. As shown by our analyses, Beijing is currently facing a heavy burden of asthma. The overall prevalence of asthma was estimated at 1.19% in the general population of Beijingers over 14 years. This corresponds to a moderate prevalence rate from a worldwide perspective,[7,8] consistent with the rating of these countries in the most recent GINA. A rising prevalence of asthma in the past decade may be attributed to rapid lifestyle changes related with modernization, changes in dietary habits and frequent exposure to environmental factors, such as indoor allergens, dust, sand storms and tobacco,[10,11] Additionally, a high prevalence of asthma could be attributed to heightened asthma awareness in the general population. These findings suggest urgent needs for sustained efforts of asthma prevention and control. Independent of setting, gender differences were quite large and significant in our study. Females were more apt to report asthma symptoms than males. The gender distribution status is consistent with the findings by other studies. [17,18] It may be related with physiologic differences between genders. Additionally, more recently, a female predominance was attributed to the fact that doing higher burdens of housework and having greater exposures to dust mite, cooking fuels and other allergens leading to airway inflammation and asthma. Briefly, this was caused by their social advantage and differential exposure to risk factors. It was recently convicted by Takeda M in the murine model of asthma. Female mice experienced more airway remodeling and eosinophils, lymphocytes, T-helper type 2 cytokines and growth factors in bronchoalveolar lavage fluid (BALF) were higher compared with male mice. In our study, the prevalence rates were significantly different among different age groups. Those aged ≥ 71 years old had a high accumulated prevalence of asthma and it was consistent with previous findings. The 60-70 age groups ranked second in asthma prevalence. This may be due to that, at least in part, asthma is a chronic non-curing disease. Moreover, the similar results were also reported by Naf. It was recently found that senile adults ≥71 years old had the highest prevalence. According to some reports, the incidence of asthma was related with ethnicity. [21-23] while others detected have no variation of asthma prevalence among different ethnic groups. [24-26] Our observations supported the latter assertion. More studies are warranted to better understand the complex interrelationship between asthma and ethnic status. Based on our findings, 16.0-26.2% of the subjects reported multiple times of emergency room visits and hospitalizations in Beijing area in the previous year. So the overall level of asthma control in Beijing area has improved but it still falls way short of GINA goals. Activity limitations and psychosocial functions were largely impacted by uncontrolled asthma. So asthma not only poses a great threat to the physical activities of the patients but also causes serious psychological problems. [26,27] Thus it is imperative to educate the asthmatics, guide their long-term management, offer standardized therapy and avoid the causes and triggers of asthma. In this way, it is possible to reduce the attacks of exacerbations of asthma, improve the life quality of asthmatics and lesson the societal burden of this disease. This study has several aspects of strengths and limitations. The obvious strengths included selecting a large sample size, employing the method of multi-stage random cluster sampling, a relatively high response rate, all suspected asthmatics being examined by a pulmonologist and final prevalence estimate based on the results of these examinations. Other examinations, such as peak flow monitoring, tests with bronchodilators and bronchial challenge tests, were also performed in a limited number of participants. Therefore, only the spirometric results were used here so as to compromise the validity of results. China Asthma Alliance offered us a unique opportunity to this population-based estimation of the prevalence and distribution of asthma in China. With respect to limitations, however, because of its cross-sectional design, a causeeffect relationship between risk factors and asthma could not be inferred. Moreover, it was impossible to estimate the economic burden of asthma. Additionally, a sampling bias seemed inevitable since asthmatics might be more motivated to participate in this survey. Thus it led to an overestimate of prevalence rate. However, these limitations should not discourage the use of such surveys. The predictive validity of self-reported symptoms is often acceptable and the observed prevalence estimates are generally reasonable. The baseline data had great effects on asthma prevention in Beijing. In conclusion, the prevalence of asthma sharply increased over the past decade and the impact of asthma was challenging enough. And asthma features of Beijing were basically outlined here. Because of limitations of a cross-sectional survey, more studies are warranted to uncover the clinical features of asthma and examine in-depth the associated risk factors and asthma. It is essential to employ large-scale population studies to characterize the distribution of asthma more precisely across all gradients in the world. Finally the issue of preventing and controlling asthma should be properly addressed to relieve exacerbations of asthma, improve the life quality of asthmatics and lower its societal burden. Gratitude went to all medical students of Beijing University of Traditional Chinese Medicine for data collection in the home interview. This project was funded by Capital Medical Development Research Fund (No: 2007-1011) by Beijing Municipal Health Bureau. WANG Wen-ya: made substantial contributions to household visit for data collection, carried out the statistical analyses, drafted and interpreted the manuscript, revising it critical for important intellectual content; SU Nan and LIU Guo-liang: conceived the study design and coordination, and have been involved in acquisition of funding, collection of data, and general supervision of the research group; FENG Xiao-kai: have been involved in data management and analysis and helped with drafting the manuscript; HE Quan-ying, WANG Wen, LIU Jian-hua, XU Zhen-yang and ZHANG Jie: participated sufficiently in acquisition of data, and oversaw collection of samples; LIN Jiang-tao: had full access to all of the data reported in this study and had final responsibility for the decision to submit this report for publication. 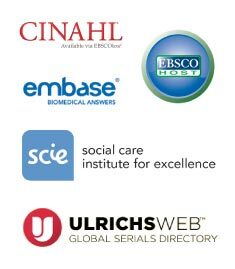 All authors have read and approved the final manuscript. Zhang XY, Morrison-Carpenter T, Holt JB. Trends in adult current asthma prevalence and contributing risk factors in the United States by state: 2000–2009. BMC Public Health 2013; 13: 1156. Song WJ, Kang MG, Chang US. Epidemiology of adult asthma in Asia: Toward a better understanding. Asia Pac Allergy 2014; 4: 75-85. Anderson HR, Gupta R, Strachan DP. Associations between socioeconomic position and asthma: Findings from a historical cohort. Thorax 2007; 62: 85-90. Demoly P, Annunziata K, Gubba E. Repeated cross-sectional survey of patient-reported asthma control in Europe in the past 5 years. Eur Respir Rev 2012; 21: 66-74. Eder W, Ege MJ, von Mutius E. The asthma epidemic. N Engl J Med 2006; 355: 2226-2235. Lin Y, Wang C, Lin J. Epidemiological survey of the incidence of bronchial asthma in occupational populations in Beijing area. Zhonghua 2002; 25: 650-654. Al Ghobain MO, Al-Hajjai MS, Al Moamary MS. Asthma prevalence among 16 to 18 year old adolescents in Saudi Arabia using the ISAAC questionnaire. BMC Public Health 2012; 12: 239. To T, Stanojevic S, Moores G. Global asthma prevalence in adults: Findings from the cross-sectional world health survey. BMC Public Health 2012; 19: 204. National Institute of Health (NIH), National Heart, Lung and Blood Institute (NHLBI), World Health Organization (WHO). Global strategy for asthma management and prevention. Global Initiative for asthma, United States 2011; 1-124. Zaknun D, Schroecksnadel S, Kurz K. Potential role of antioxidant food supplements, preservatives and colorants in the pathogenesis of allergy and asthma. Int Arch Allergy Immunol 2012; 157: 113-124. Wood LG, Gibson PG. Dietary factors lead to innate immune activation in asthma. Pharmacol Ther 2009; 123: 37-53. Wang G, Peng Y, Du C. Epidemiological survey on bronchial asthma in Henan province. Chinese Journal of Tuberculosis and Respiratory Diseases 2002; 25: 25-28. Chen P, Yu R, Hou X. Epidemiological survey on bronchial asthma in Liaoning province. Chinese Journal of Tuberculosis and Respiratory Diseases 2002; 25: 603-606. He Q, Ma Y, Zhang R. Study on the epidemiological difference of four kinds of chronic respiratory diseases in the urban and rural areas of China. Chinese Journal of Epidemiology 2006; 27: 459-460. Rönmark EP, Ekerljung L, Lötvall J. Eczema among adults: Prevalence, risk factors and relation to airway diseases. Results from a large scale population survey in Sweden. Br J Dermatol 2012; 166: 1301-1308. To T, Stanojevic S, Moores G. Global asthma prevalence in adults: Findings from the cross-sectional world health survey. BMC Public Health 2012; 12: 204. Tollefsen E, Langhmmer A, Romundstad P. Female gender is associated with higher incidence and more stable respiratory symptoms during adolescence. Respir Med 2007; 101: 896-902. Takeda M, Tanabe M, Ito W. Gender difference in allergic remodeling and immunoglobulin production in mouse model of asthma. Respirology 2013; 18: 797-806. Nafti S, Taright S, El Ftouh M. Prevalence of asthma in North Africa: The asthma insights and reality in the Maghreb (AIRMAG) study. Respir Med 2009; 103: S2-S11. Weqienka G, Joseph CL, Havstad S. Sensitization and allergic histories differ between black and white pregnant women. J Allergy Clin Immunol 2012; 130: 657-662. Weqienka G, Havstad S, Joseph CL. Allergic sensitization frequency and wheezing differences in early life between black and white children. Allergy Asthma Proc 2012; 33: 493-499. Oraka E, Iqbal S, Flanders WD. Racial and ethnic disparities in current asthma and emergency department visits: Findings from the National Health Interview Survey 2001-2010. J Asthma 2013. Winer RA, Qin X, Harrington T. Asthma incidence among children and adults: Findings from the Behavioral Risk Factor Surveillance system asthma call-back survey-United States 2006-2008. J Asthma 2012; 49: 16-22. Zahran HS, Bailev C. Factors associated with asthma prevalence among racial and ethnic groups-United States, 2009-2010 Behavioral Risk Factor Surveillance System. J Asthma 2013. Goral A, lipsitz JD, Muhsen K. Depressive symptoms, risk factors and sleep in asthma: Results from a national Israeli health survey. Gen Hosp Psychiatry 2012; 34: 17-23. Stanley J Szefler, Donald YM Leung. Severe asthma: Pathogenesis and clinical management. Marcel Dekker, New York 2001; 389-418.